And before you go, below is a photo of all the papercrafting supplies the our reader Deb J has been decluttering this week. Well done Deb! Have a great weekend everyone and happy decluttering! I met some friends in UPS a couple of months ago and they had sold their complete set of china. The husband was packaging it up, and told me that they finally realized that after all these years they had hardly ever touched it so why keep it. It took going overseas for a year to help them have a chance to look at their things from a different perspective, but they did. He told me that they were getting rid of all kinds of stuff that they never used and just kept. Talking to him that day made me come home and look around at the things we have and see if there was anything I could get rid of that we don’t use. I have china that we don’t use too often, but I love it and want to start using it more regularly instead of getting rid of it. I am sure the dishes may break and the crystal goblets may too, but we will enjoy the memories of fun dinners and feel a bit more special as we use it more often. If we find it is too much trouble to use it after a year or two, we will pass it on to one of the kids if they are interested. I think one of the things I like most of all in that video was the woman who took an interest in his learning problem and helped him. How much better it is to help people than to just collect stuff. Go for it. We use my mother-in-law’s 70 year old china from time to time. During a recent dinner party one of the plates went ‘ping’ and a crack appeared. No tears shed. Dishes were made to be used. And it was a great party. Yeh Wendy, use it and lose it sounds better than use it or lose it. Thank you Colleen! I did enjoy Steve Edge – what a guy! He was good wasn’t he. There is hope for me yet, there are plenty of uneducated rich people out there. All you need is imagination. Awesome video thank you! I shall forward the link to my dyslexic niece. I too never got the ‘keeping things for best’ mentality. But I do tend to wear my tatty old house clothes the most…guess I am still learning! Karen, those tatty old house clothes are probably the most comfortable. That is what I like about mine. Is that a quote Snosie or are you speaking for yourself here? If it is you I do hope the butcher is giving you a discount as a mark of gratitude. LOL!!! I missed Snosie’s comment at the time, and just happened upon it now – Thanks, both of you, for the chuckle! Great video. It’s amazing what one lady helping a kid did. Shows you we need to do more helping and less criticizing/making fun of. I have a really nice winter coat. We don’t have winter here. I’ve hung onto it with the idea that if we ever went back to see family or something during the winter I would need it. Guess what? I’m going to give it to the women’s shelter in one of our mountain towns. What better way to see it get some use. Cause why in the world would I want to go visit in the winter?! Hi Deb J, I need you to remind me about that coat in about May so I remember to ebay the last of our ski gear. It is wasting a lot of space in the drawer at the end of my bed. Like you I don’t envision ever using it again. Wow Cindy, that guy is amazing. I had great fun. Thanks for sharing! Thanks for the “Saturday recipes” suggestion for the week: I haven’t chucked the collection, but I’ve certainly made a hole in it. Recycling and book fair win. So do I, the drawer is much easier to open and shut! That just goes to prove that decluttering does make life easier. In little ways you might not even notice sometimes because they slowly sneak up on you as you slowly declutter, but they are there. Great video! And not just the dress for a party message. I will be passing this one around at my work. Share the love Calicoginger! Share the love! Just had to report that everything in that picture above is gone. 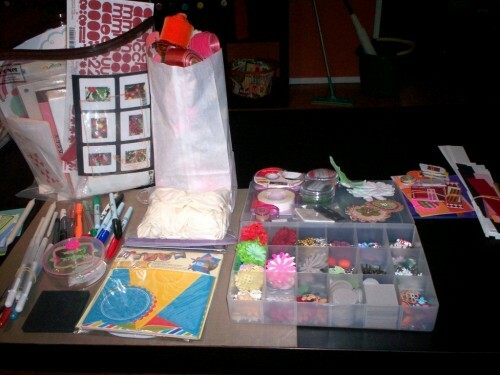 the girls that come over on Friday’s to make cards and scrap all took the stuff. Love it. Woo Hoo! I got the phone number of a lady when I was at the thrift store the other day who said she would be interested if I decided to sell more crafting stuff. I sent her a text message but I haven’t heard back. I hope she didn’t give me a false number. I loved the video. Thanks for the link! I bad to “save” special things – usually art materials, not china. I need to start using them or declutter them. Delona, isn’t it funny the way we collect art & craft stuff and then want to save it for just that special project. I had a friend once who I tried to teach to scrapbook but she couldn’t get over being nervous about cutting the paper in case she did it wrong and wasted it. It just wasn’t the craft for her.